“For spring-time is here! the summer is here! and what is this in it and from it? Our August garden always graces us with the highest yield of tomatoes and peppers, and this year we have them growing in all shapes and sizes. I’ve been having at least one large ruby red tomato a day, sprinkled with a little flaked sea salt and fresh cracked black pepper. If I had to describe how summer tastes, this simple meal would be it. Another one of my favorites is a simple tomato mayo sandwich on white bread. It’s kind of like the lazy gal’s BLT, and it’s heaven. 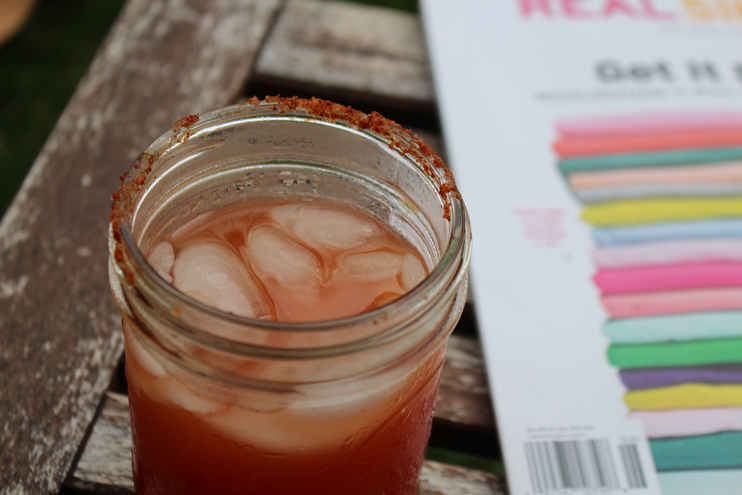 Moving on from whole tomatoes to tomato juice, because summer. I’ve been adding a splash of it to my beer with a chili lime salted rim when we have BBQ’s. It adds a little oomph to your average brew, and I quite like the spice. 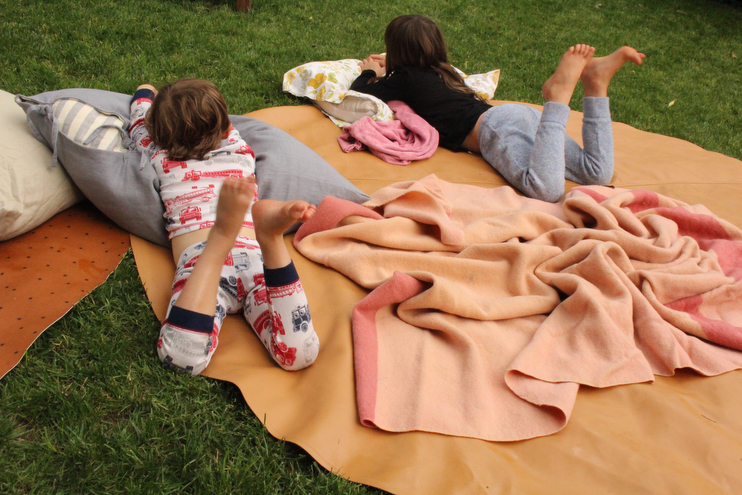 Before the weather turned hot and humid we had quite a few movie nights with the kids in the backyard. I think everything is a bit more fun and carefree when taken outside of it’s usual element, especially if taken outdoors. The bonded leather play mats you see above are made with care by Gathre and are wonderful to have if you’ve got little ones. We take them camping and use them for crafts indoors, I recommend them to all my mama friends! This is what a pretty corner of our flower garden looked like before the boys rode their tricycles through it and trampled it to death in a game of chase. It was a beaut while it lasted, and I am really thankful they missed the daisies growing in the back! Boys. Onto autumn flower planting later this month and cheers to quick growing flowers. I don’t get too excited about cooking in the summer time because it’s always too sticky and our schedules have gone amuck as they always do during the vacationing months, but I do love simple, wholesome meals on the grill. They couldn’t be easier and there is no supper mess to clean up! Our kids love sweet corn and green beans, so we take advantage of having them in season and eat at least once a week. Shucking is a great chore to give the kids, by the way. They love pulling back the husk and taking off the shiny bits before rolling them in olive oil. If you don’t care to grill the corn, boiled with butter and salt is wonderful too. I took this photo after doing dishes one evening when Andrew was giving the kids a bath before bed. 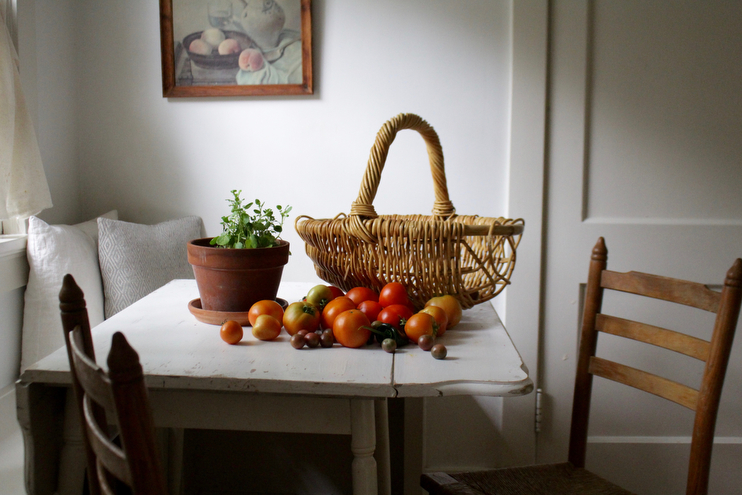 I had just put the last of the dirty dishes in the dishwasher and had wiped off the counter, and a golden summer glow was dancing on the butcher block in the shadow of the glass vase my birth mom gave me a few years back. It was really beautiful. Note the second French press brewing. It was one of those days. I also so love and enjoy the quiet moments alone when putting the kitchen back together after we eat. It’s that quiet after the storm kind of solitude that gives me all the feels and refreshes me after a long day. Dye experimenting #1: avocado pits makes blush! Pretty huh?! Just so I remember what lunch looks like in this season of life as stay at home. Cue messy messy carbs strung all over the dang place. But you know, one day there won’t be smudges on everything and meal time won’t be such a chore, and to be frank, I am going to miss the hell out of it. The days are long but the years are short. I’ve gotten several questions about our enamelware and it came from Lil’ Bellies. They are very durable and perfect for little ones. I honestly don’t even remember taking this photo, but it must have brought me joy because I did indeed take it. Light moves about in the most predictable ways in our home, first starting in the front of our home as the sun rises, and moving then its way towards the back of our home as the moon makes its way up up up. I love following it around like a cat, always inspired by it’s warmth and light. Because we have old windows light hops around when it hits it, making delicate shimmery patterns all over the walls and floorboards. It’s this kind of old home magic that helps me get through the scary basement situation, the creaks that wake up Alfie when he naps, and the endless maintenance. Old homes are not for everyone, but they are very much for us. Have you ever made homemade pinecone bird/squirrel feeders? They are easy enough for little ones to help and only require 4 ingredients/materials. To make, coat your pinecone in nut butter, roll liberally in bird seed, and then tie somewhere the birds and squirrels like to roam. That’s it! The kids have been really intrigued by the life cycle of caterpillars this summer so we’ve been learning all about them. This book has been a good one to illustrate the process, but the best kind of learning is always the hands on kind. Theodore let this little prickly fellow crawl all over him one morning and it was wonderful seeing him bond with nature. We went to our book and tried to find out what kind of butterfly he would grow up to be. Stella has been my biggest helper and sidekick this summer and it’s been such a treat having her home. Every day she asks me, “What may I help you with, mama?” I melts me every time. I usually give her easy jobs like folding or picking up, but lately she’s been wanting to learn how to make supper so we’ve been doing that together. I am working on an age appropriate chore list in a PDF so you can see how we delegate chores and what age is good for this or that. Andrew and I celebrated our 8th wedding anniversary this July and it’s now official: we’ve been together over half of our lives. I am sure you know this by now, but we are high school sweethearts and have been together since freshman year! I have a big box holding the dozens upon dozens of notes we passed to one another tucked away in a cupboard for safe keeping. It’s been awhile since I’ve read them, but as I recall, they are hilariously sappy and sweet. We hosted a family get together a few weeks back and watched The Sandlot on a white sheet in the yard. There were something like ten kids under the age of six running around, so it was mostly a nostalgia fest for the adults. Angus is growing! Adding this little blue eyed boy to our family was one of the best things we’ve ever done. He’s added so much joy and love to our days, and honestly training hasn’t been too difficult. *Knock on wood. * He’s had accidents, yes, and destroyed a pair of my shoes, sadly, but we are almost out of that phase. I’ve been picking, preserving, and pickling quite a bit this summer. Peppers and tomatoes predominantly, but cucumbers and some root vegetables too. I am not an expert canner by any means, but I do enjoy the process and the delight of eating garden tomatoes in the chill of winter. Before the season ends, I am going to do several canning posts for you and share a few of my favorite recipes! Dye experiment #2: walnuts make chartreuse! Who would have thought?! As much as I am looking forward to school starting up again and getting my hands dirty in some home schooling lesson planning, I have absolutely loved having Stella home this summer. I’ve read countless times that our kids aren’t supposed to be our best friends, and I don’t believe that for a hot second. She is mine, through and through. We are very similar, so sometimes our stubbornness gets the better of us, but for the most part we are joined at the hip from 9-5 until dad comes home. This has been the year where our relationship has taken on a new shape entirely. A softer, deeper shape. She has never been more independent, more creative, nor more inquisitive about homemaking and nature and travel. It’s been a delight guiding her through her curiosities each day, and it’s help grow mine in the process. Being a mom is undoubtably the most humbling and exciting adventure. Thank you for sharing this, it was all so lovely, enjoyable, and inspiring! I have two questions from this post- 1.) About the avocado pit dye, about how many do you need for that pot, and do you just boil them whole, or do they need to be cut open somehow? Very pretty indeed! 2.) You mention planting autumn flowers soon, and always seem to have a nice garden of things growing. I never know *when* to plant the right things. Do you think you could share posts of what you plant, when you do (or maybe even a week or so early), so that we can maybe plant along with you and know what to get ready? Love your site. Was wondering what kind of outdoor projector you use and how do you get all those movies, TV shows streaming to it?